There is a total eclipse of the moon on January 20th visible all over the U.S. All you need to see it is at least one eyeball and a clear sky. It is also a super-moon. 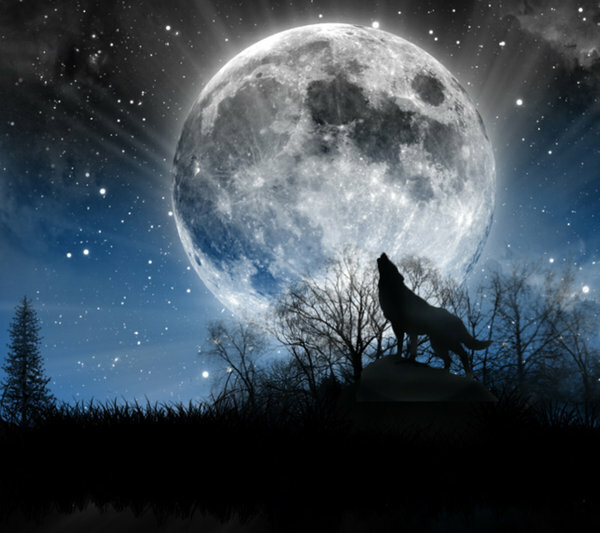 The full moon in January is called the wolf moon. Ed, thanks so much for your postings. I really enjoy them. Last Friday, on the winter solstice we were driving home through the open countryside. Just after sunset the western sky was completely aflame with orange-red, high altitude, cirrus clouds. At the same time the full moon had just risen in the east, complete with the illusion of larger size when low to the horizon. In this moment of transcendent and temporary beauty, I thought 'Surely, pagans had the right idea about worship'. Just by chance, I also saw the rising moon at the winter solstice. My wife and I were driving home from dinner and road was pointed directly on the rising moon allowing a view nearly to the horizon. The moon looked huge. It was also nearly a supermoon, depending on the exact definition, making it appear larger. By far though, just seeing it near the horizon makes the moon look larger due to the optical illusion. The moon will be high in the sky during the upcoming eclipse so the horizon effect will not be present. This is only tangentially related, but I found this obituary very interesting. This woman's lack of public stature is evidence of the misogyny still present in our society. The traditional roles in men's and women's work has changed quite a bit since Nancy Grace Roman was getting educated and looking for employment in the 1940s. I am not sure that misogyny is the right descriptor for the barriers Nancy encountered in pursuing her interest in a STEM field as I would not apply the descriptor of misandry to the difficulties men faced in pursing a career in nursing. A little background in men and women's roles may be enlightening. Since the beginning of the genus Homo 2 million years ago human genders moved to a division of labor as specialization is more efficient and therefore more adaptive to the success of the group. The specialization of traits are tied inexorably to x and y chromosomes. The gender specialization of labor actually began long before humans arrived. Female mammals have always been tied to the caring of the young as nature gave them mammaries. The natural order of all societies has always been women managing the camp and foraging nearby while men were hunting and protecting the camp through violence if necessary. This was the lifestyle for almost the entire period of human existence. Sexual dysmorphism is one of natures strategies employed in the division of labor. Besides physical traits there are also cognitive trait specialization that mother nature imbued on men and women. Traits desirable around the camp are nurture/empathy and good communication skills necessary for working out social problems. 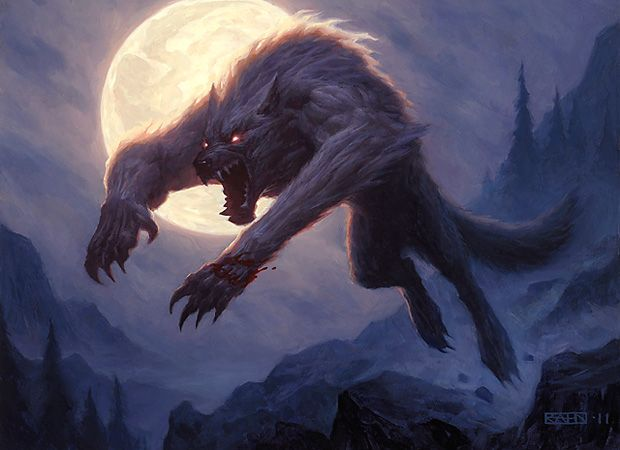 Traits that are desirable in hunting are strength and enhanced visual/spacial abilities leading to more kills when throwing a spear at your dinner. One better have a lot of toxic masculinity when the neighboring tribe comes to still your tribe's women/food/resources/territory. These are the traits that mother nature gave men and women to maximize humans chance for continued existence. Then the industrial revolution came to be and created new rules for success. Mechanization greatly reduced the necessity for strength. Specialization of labor began to depend more on cognitive ability than physical atributes. While the industrial revolution happened in the blink of an eye, human's gender specializations imbued by nature only change slowly over long periods of time through the slow process of evolution. Cultural roles began to adapt in response to cognition now being the most desirable attribute over physical strength. In the 19th an 20th centuries gender roles began to adapt to this and by the 21st century gender roles have all but faded away in western societies, with the exception of reproduction which is still solely physical. What this does not mean is that men and women will have the same career ambitions as one another as they will likely pursue what careers in which they are best and most interested. In today's society, women pursuing STEM careers like Nancy Grace Roman are welcomed and encouraged. What this also does not mean is that the proportion of men and women astronomers or nurses will be 50-50 unless it is forced. People, check out another NASA great job, read about Ultima Thule ! Here is a link, although I am not sure if this article is behind the NYT paywall or not. It has been a long journey to the planetoid Ultima Thule. 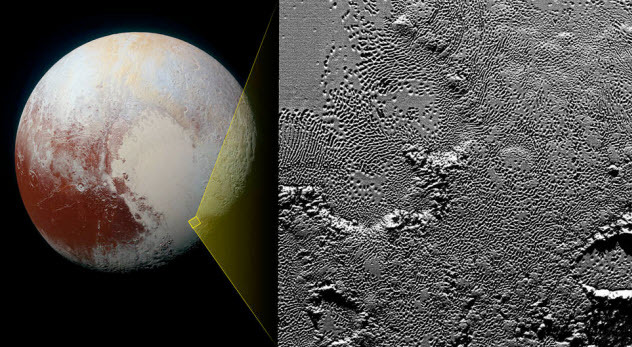 Th New Horizons spacecraft was launched in 2006 and flew by Pluto in 2015 and delivered much science about Pluto. The spacecraft is scheduled to fly by Ultima Thule (only 20 miles in diameter) on January 1st. The Jet Propulsion Lab has a long history of very successful missions. Pluto's orbit is in red and UT in white. Here is the viewing forecast for the Lunar eclipse, Sunday evening January 20th. 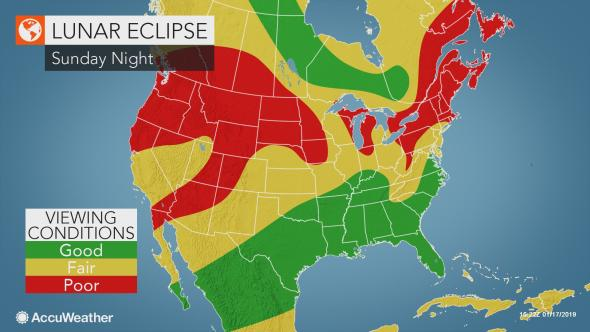 The southeast looks to have the clearest skies, but folks in the yellow areas can likely see some of the eclipse as it may be visible through gaps in the clouds.